Gladwyne Animal Hospital is the first hospital on the Main Line to adopt a Fear Free Hospital mission. Fear Free is a movement in the veterinary field that prioritizes the emotional welfare of veterinary patients, pet owners, and the veterinary healthcare team. 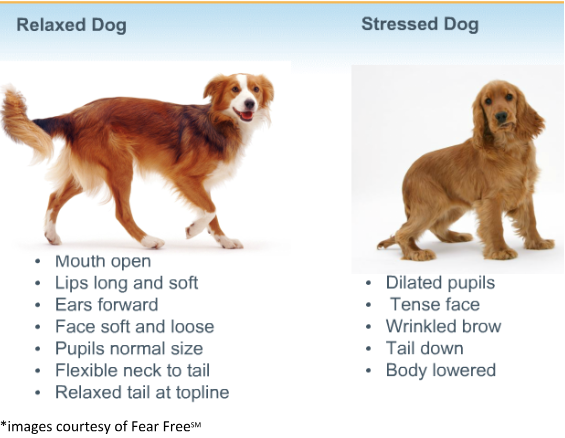 Fear Free certified veterinary teams are trained to recognize Fear, Anxiety, and Stress (FAS) in patients to avoid uncomfortable experiences for pets and their owner, aspire to positive veterinary visits and provide higher quality veterinary medicine. 2.Gentle control – is the care that the veterinary team safely and comfortably provides while working with your pet. In addition to this more conscientious approach, understanding how cats and dogs communicate FAS and striving for good communication between pet owners and the veterinary team are essential for a Fear Free experience. 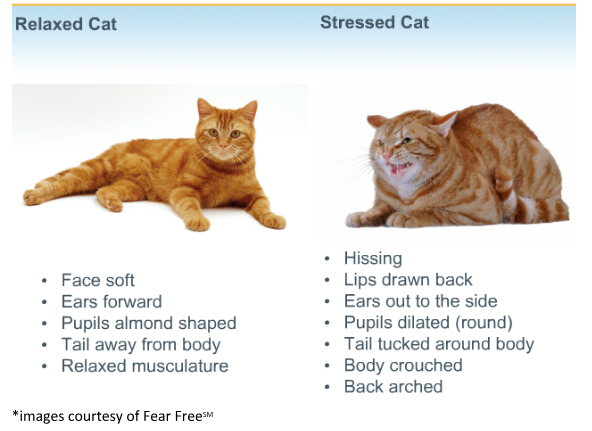 Please see our Fear Free Handouts to better recognize signs of FAS in our pets. We can work together to improve veterinary visit success by discussing any concerns that you may have about your pet’s behavior, better tailoring physical examinations to your individual pet and upholding Fear Free Concepts. Thank you for entrusting us with the care of your beloved pet. Please see the images below of FAS in our pets. Knowledge of body language and behavior is very important in recognizing and then avoiding FAS in our veterinary patients. Fear Free medicine begins well before you arrive at the Veterinary Hospital with your pet. Please see our Gladwyne Animal Hospital tips below to ensure that the home preparation, transport, veterinary appointment and return home are as comfortable for you and your pet as possible.